Moynihan Station is to occupy the current Farley Post Office on 34th Street to help alleviate pedestrian congestion for the Amtrak, New Jersey Transit & Long Island Railroad in Penn Station, across the street. While the plan was conceived 25 years ago, ground was broken on the project in 2010 and Phase 1 is expected to be completed this year, in 2016. Skanska, one of the worlds leading civil construction groups, hired Michael Benabib, industrial photographer, to make images of both employees and of the construction project for a new proposal. 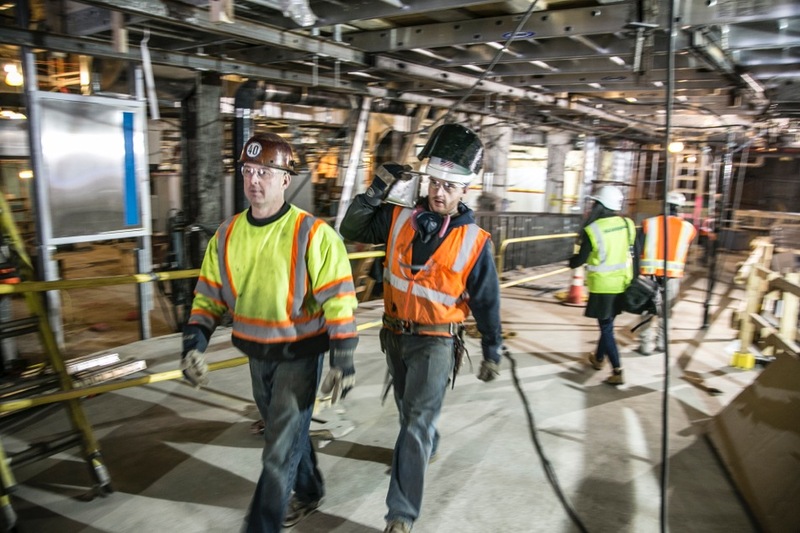 After donning hard hats and reflective vests, we entered the construction site – to document the progress on phase 1, which involves installing an emergency ventilation system and new entrances to the building, as well as photograph the empty spaces where phase 2 will begin. The James A. Farley Post Office Building was designated a New York City Landmark in 1966, so extra care on this project is made to keep the external façade of the building intact.